The purpose of this project is to encourage and guide adult learners in various parts of Europe to creative learning and activities using new information technology tools. The project also enhances creative language teaching pedagogy, especially in peripheral areas. The project brings together adults of different age and background and ICT experts in e-learning. The main goal of the project is to empower motivation of continuous learning and creativeness of the adults. The objective of the project is to create possibilities for adults’ personal development in computer literacy and foreign languages using creative education methods, e-learning methods so that participants could adopt knowledge gained in practice within their local communities or at work. All partners will organize a target group of adult learners who will take part in international workshops and disseminate the knowledge gained at the local level establishing their own learning circles. The ICT experts in e-learning will develop the content of the international workshops and carry them out during the project lifetime. In addition the project will focus on civic and cultural competencies of adult learners through cultural activities and the English language teaching which easily joins different cultures and enables rich culture exchange. The partnership will create a European wide forum for the project and a sustainable platform for future development of creative education. All created materials will be presented in all partner countries via project website in English and their native languages. Working together increases international understanding and social inclusion. Dissemination events at local level will permanently promote local knowledge of creative education in all partner communities. To improve the accessibility to lifelong learning for adults by presenting the status of adult learners in partnership countries, difficulties they encounter and by presenting joint solutions. To provide people 45+ especially from the rural areas with tools to improve their knowledge and competence in IT and foreign languages in order to avoid their social exclusion. To facilitate the cooperation between partners’ organizations. To strengthen understanding of European cultures and languages and mutual respect. To improve the quality of adult education by implementing blended learning approach in delivering workshops on Web2.0 tools and new generation of ICT tools which will let teachers to get experience and adopt this approach in their teaching practice. To develop communication skills and general cultural competencies of adult learners and teachers. To support the creativity of the learners and teachers to be active open-minded European citizens. We will start from the state of existing practices and needs in partner countries, from the applicant’s experience and from the consortium skills. Common and shared study will identify local needs and training workshops will be developed and delivered in partner countries responding these findings. Appropriate methods and the adults needs will be taken into account while developing these workshops. We know that we “ learn by doing“ and“learn while doing“ so all participants will be actively involved in all the stages of this process. Training and assessment of learning outcomes will be piloted on at least 20 adults per country, project objectives, performance and outcomes will be promoted and disseminated in partner countries through various media tools. Besides the content of the workshops will be facilitated with the possibility for adult learners and teachers to exchange their experiences and practices. This will contribute to increase the awareness of the varied European social and economic scene and participants will get better understanding of the areas of common interest. Knowledge about other cultures, democratic values, citizenship contribute to individual‘s capacity to listen to what people from other background can bring us. The partnership involving countries from different European regions will provide participants with valuable opportunity to understand the corresponding cultures and the richness of EU cultural diversity. Google workshop 2 : Hangout! We are aware that the success of the project relies on the participants, their commitment and their ability to cooperate. All partners have to contribute not just because of sharing responsibility but also for the feeling of each participant that he/she is valid member of the project team. All partners have common responsibilities during the project: participate in the international meetings, contribute to the final products, tools and published materials,implement activities and tasks given in due time, translate final products in their national languages and disseminate in local and national level, prepare and present a paper on a relevant topic in the final conference. Plunges SSC as coordinating institution will be in charge of project implementation, management, communication among partners, coordination the project meetings, hosting the final management meeting and international conference, monitoring the mid-term and final project reporting, on-line workshop "Blended learning. Breaking the boundaries of the classroom." E.U.C. Research Centre Ltd from Cyprus will conduct workshops "Free Software applications“, „Game-based Learning" and „Learning Content Managing Systems and Web 2.0 Tools", host a kick-off meeting. University of Naples will conduct a workshop " Innovative learning approach: Using Social Network and Mobile Applications as Tool for Adult learning", host one partner meeting. NGO from Turkey will launch a project website and a discussion board, constantly update web page and run it for the project lifetime and after it. Partner from Poland will host a meeting, conduct a workshop "Creating ICT Based Lesson Using Wiki". NGO from Bulgaria will be responsible for the minutes of the project meetings, evaluation of project activities and host one partner meeting. 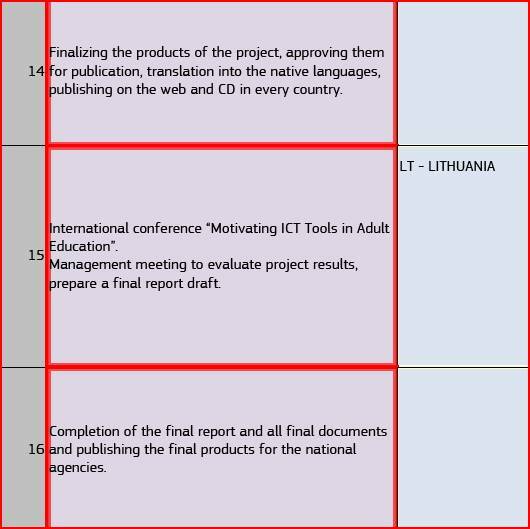 E-Seniors will host a partner meeting and monitor the development of "Tutorials for the use of the ICT tools presented at the workshops in English and in all partner languages and publish on the project website and CD. CEDRU will coordinate project's dissemination process and monitor the development of "Manual of good practices of using ICT in education process and publish on the project website and in CD". Partner from Sweden will host one partner meeting and will be responsible for the project promotion materials and final products design and prepare them for the publishing. The cooperation between the partners will be based on a regular and prompt exchange of information. The English language will be both the working and the communication tool. The Internet, together with its available communicators will be the main communication tool. A partnership forum will be opened for review, discussion and exchange of materials. More traditional forms of communication will not be excluded (mail, telephone, fax). The partners ascribed to certain project tasks will be responsible for regular communication with the coordinator and other partners. Working to a deadline will also entail meeting the deadlines set by the project. The project partners’ cooperation is described in detail in the work plan. Each partner obtains a role according to the potential and priorities in the project and jointly contributes to project success. Each partner will be able to present the own point of view on the issue at the working meetings. Each partner will be able to comment on the project activities and products in order to improve the quality of the project. The voice of partners will be taken into account so that the outputs reflect the views of all participants. Project management meetings will be documented and will be available for use in the partnership. -identifying learners‘ needs and planning project activities considering the results. The planning of the Partnership is prepared in close consultation with the learners in the various countries. There is no experience in this new group of cooperation, so the interests of the learners should be identified, to make it possible so that later provided information and classifications perfect fit for this group. -participating in international and local workshops. 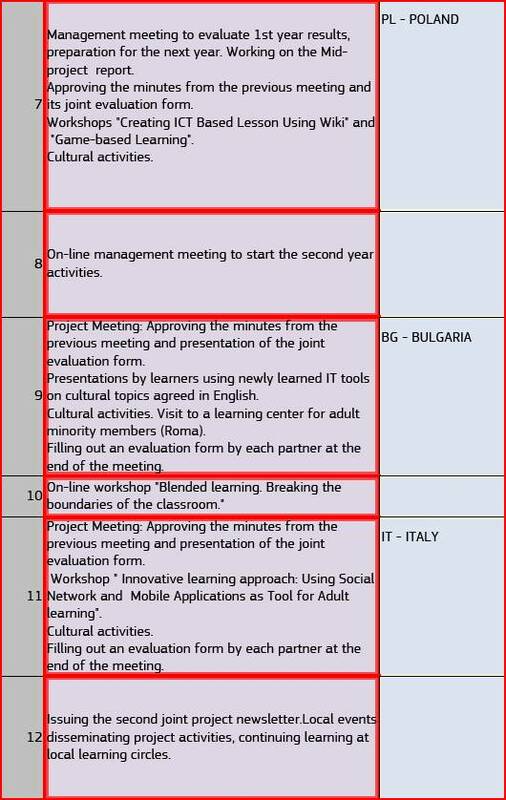 Learners will participate in the project meetings (exchange of training activities in partner countries), as well as in the workshops, which will end with a certificate. -applying new knowledge at work or in private life and sharing experiences with other partners. The activities and the work plan will be integrated immediately in the annual program of all participating institutions which supposes a specific analysis on its suitability, the way to design appropriate activities and the way these activities can be effective. The basic work on the project will be done by the project partners at the local level involving target group learners in the workshops. Working group will be formed at each participating institution which will carry out the project activities according to the objectives of the project. The group will have its own two-year curriculum responding to the project objectives and outcomes. This curriculum of each partner country will have its special features responding to the needs identified at the local level. Plunges suaugusiuju svietimo centras, University of Naples "L'Orientale"- Lifelong Learning Centre, E.U.C. Research Centre Ltd from Cyprus, Centrum Edukacji Nauczycieli w Koszaline will involve teachers from local schools who need to acquire ITC skills for their job. NGO from Bulgaria and Turkey, Ostra Grevie folkhogskola from Sweden will involve adults from disadvantaged groups(unemployed, from regional minorities), CEDRU from Romania and E-Seniors from France will involve elderly people that is to say people who wish to stay active and get insight on European activities that may provide them ideas and motivations to mobilize themselves for self-employment and self-promotion. Initial evaluation(based on the concept of self-evaluation) to review the whole project with the activities and their consonance with the objectives that must be reached. It will be important to evaluate activities objectively to see if they are realistic and profitable. Continuous and formative evaluation. Permanent activity which main goal is to correct mistakes and to find alternatives, so that the group work can improve along its own development. A simple questionnaire approach will be used at the beginning and end of each trans-national meeting to establish if needs and intentions of the meetings are being achieved. Results of the different project activities (local and international) will be assembled, discussed and evaluated. Necessary amendments will be made. Quality evaluation, decisions, amendments or changes will be discussed together and common agreements will be reached in open discussion. In the course of working visits ongoing evaluation in the form of interviews will be conducted. It consists of collecting comments from participants about the performance of objectives, the effectiveness of cooperation and communication. After the training, which will take place in partner countries, the evaluation will be conducted according to the standardized questionnaires or surveys. Evaluation of local activities will be carried by institutions' project coordinators who will organize regular evaluation sessions which will include discussion, progress reports and agreeing on modifications and also multiple intelligences forms of evaluation such as sand evaluation, questionnaires, visual arts, posters and interpersonal evaluation. 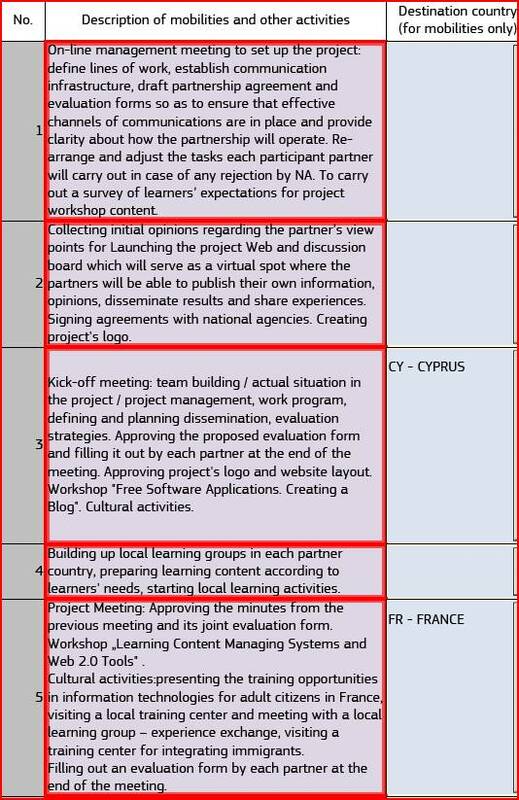 The goal, learners knowledge, further education and training situation to teach in the partner countries will be pursued throughout the project period and the beginning of each transnational meeting (project meetings) will start with an evaluation of the previous activity overview. Final evaluation will determine if the objectives of the project have been reached. We have to pay attention to partnership final products, partners participation grade in all kind of tasks and project results achieved. The extensive project final evaluation will be done using online tools. A comprehensive valorization strategy will be agreed at the first partner meeting with a written strategy document to be addressed and updated during partner meetings. Dissemination will start at a local level and then widen, through the website and the partnership. All partners will ensure that the work is made public within their local ‘communities of interest’ (eg. other educational institutions, local networks & authorities & local media). The project will develop materials that display the students’ learning and these will be disseminated as the project progresses and at the project conclusion. During the progress of the project the partner meetings will be used in each locality to disseminate the work being performed. In addition the project results and accompanying evaluation will also be disseminated within and beyond the project, through social networks, websites, workshops, seminars, local media. The current results will be continuously presented during the partners' staff meetings and are always accessible through the electronic networks. The results are not only accessible to directly involved adult learners , but also to all other people and the bodies of the institution. All partners are locally net-worked in various forms, whether more on education activities, the corporate network or group of regional development. Through its participation in this project they will include local network for sharing the results, in contact with international participants of the project. Above all, the local environment is to point out the economic opportunities. The project results are accessible at all times on the website , even over all other documentation for the project (flyers, reports, newsletters, press releases). All partners will answer questions about the project and provide guidance on when a device wants to start something similar. This is true during the project and also for the aftermath.